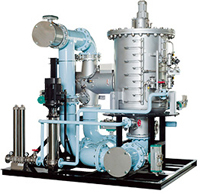 Miura's ballast water management system is a clean device that sterilizes the water with a combination of filters and UV. The filter and UV system developed by Miura effectively capture and sterilize ocean organisms. Operation is simple using a touch screen. You can check the status of the system on the display of the control panel. Multistage cleaning using filters developed by Miura and ultraviolet is used to sterilize the water without using active substances, so there is no impact on ocean organisms when the treated water is discharged. Miura supplies everything from consumable supplies to large, functional parts, providing reliable maintenance. In addition to Japan, we have permanently staffed offices in Amsterdam, China, Houston, Singapore and Taiwan.